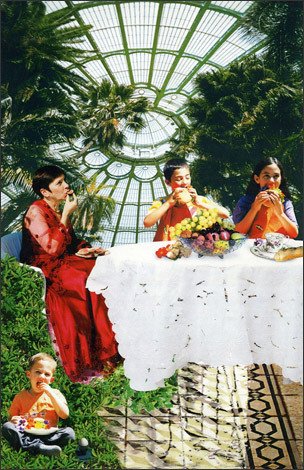 This work depicts a family dinner with a mother and three children. The meal takes place in a greenhouse type structure in which palm trees are rising on both sides of the roof. Each element of the work, as well as the fact that no father is present, has symbolic or social significance. Each fruit or flower that appears has symbolic meaning in Christianity, Islam or Judaism. The foods were chosen for their symbolism, to evoke the religious-ritualistic meaning of eating. At first glance, the meal appears to be a banquet of health, free of junk food. Although the children are clutching a hamburger bun that suggests otherwise, peeking out from the bun with its connotations of fast, low-quality food, we see lettuce leaves and flower petals, nasturtium and pansies (a fashionable, contemporary addition to the salad). The woman is eating cut figs, bringing Eve to mind and the fruit of the tree of knowledge. She stares into space, disconnected from the children. The pansies are also linked to memory and love, as well as the Holy Trinity. The grapes carry associations of the ancient spies, who returned from the Promised Land with grape vines and hope for a new life for the Israelites. In Islam, too, wine is the choice drink in Paradise, and, for Christians, the blood of Jesus Christ. Cherries are the fruit of Paradise for Christians, and often appear in the hands of the baby Jesus. On the table one can see bread, a rolling pin, and, beside the boy, an egg. These two basic foodstuffs are replete with meaning. The egg symbolizes the source of life, womb, birth, and the universe, as well as the symbol of hope and eternal life. In Christianity, it sometimes symbolizes the virgin birth. During the Nazi regime, it was forbidden to sell bread and eggs to Jews. Bread, of course, is the staff of life; it symbolizes food for the body and soul. Bread is also important in Christianity during the celebration of the mass, where it symbolizes merging with the body of Christ.